Congratulations! You've made it to the (almost) end of the grade 11 comm tech course and you only have one more major project to tackle - the summative portfolio. 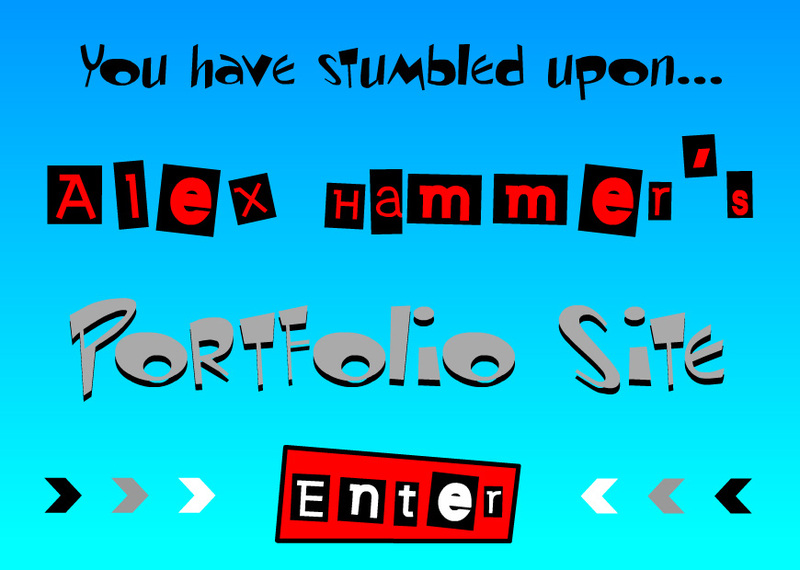 During this project, you will complete the portfolio website you designed near the start of the course. 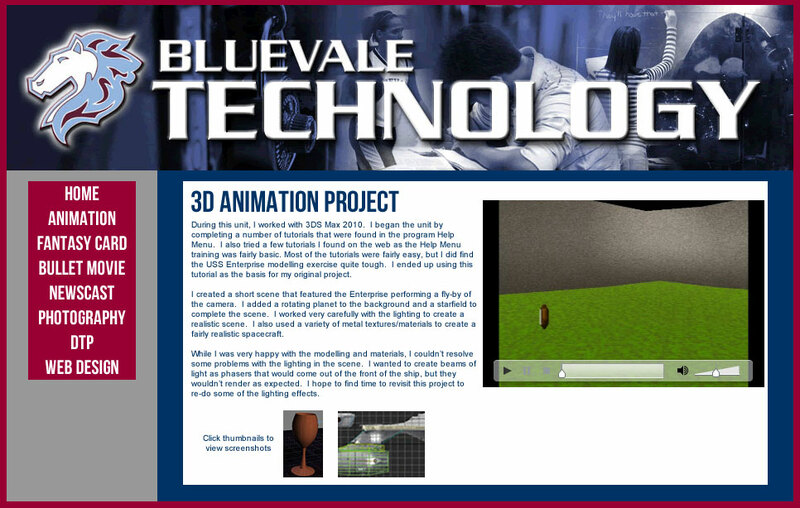 This site will showcase all the major practical project work that you have worked on throughout the semester. 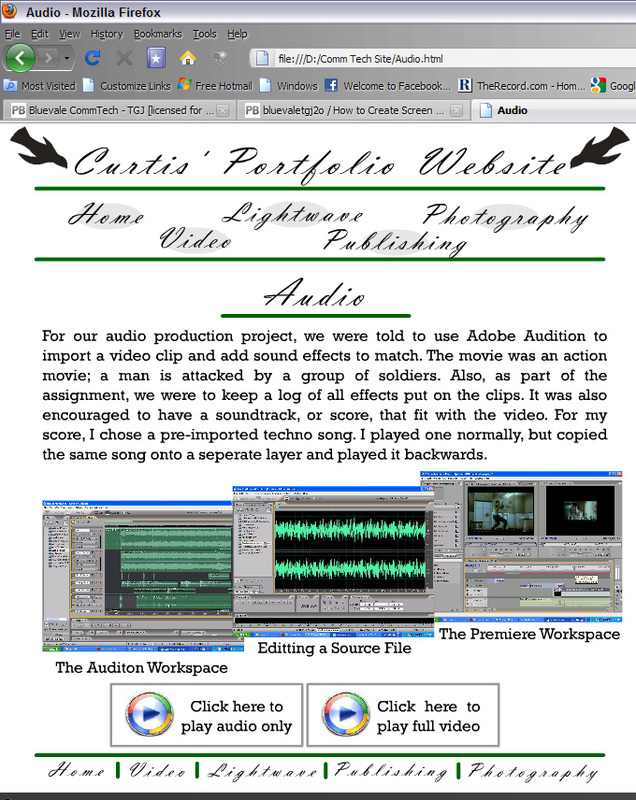 See the detailed description below for what your portfolio site will contain. You will have approximately 5 classes to complete this activity (should have significant work completed on this activity prior to summative unit). 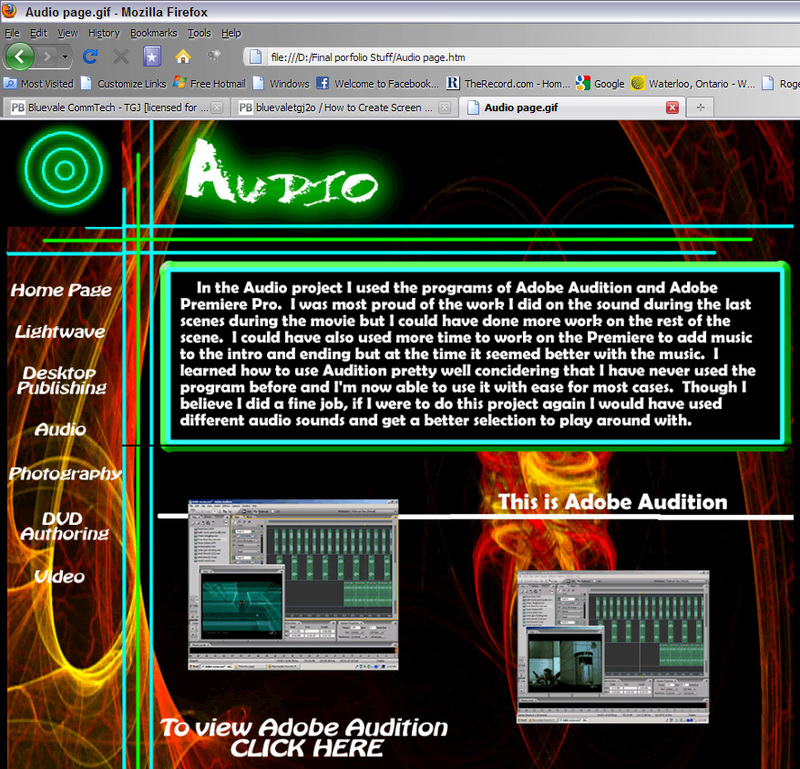 You will need at least the following pages for your site (you can add more if you'd like). These should be the button links featured in your navigation area of your site. This page basically highlights your rough work designs (take a photo of your sketches) as well as your work in Adobe Illustrator. This page will showcase your work in Adobe Photoshop; you may also include your work in Illustrator, i.e., combine the Logo Design page within the Graphics Page. Or InDesign: This page should include your work in InDesign (photo manual) as well as your photography and use of the various digital SLR camera(s). Your group's work from the Google Doc's to final work in Adobe Premiere should be included. 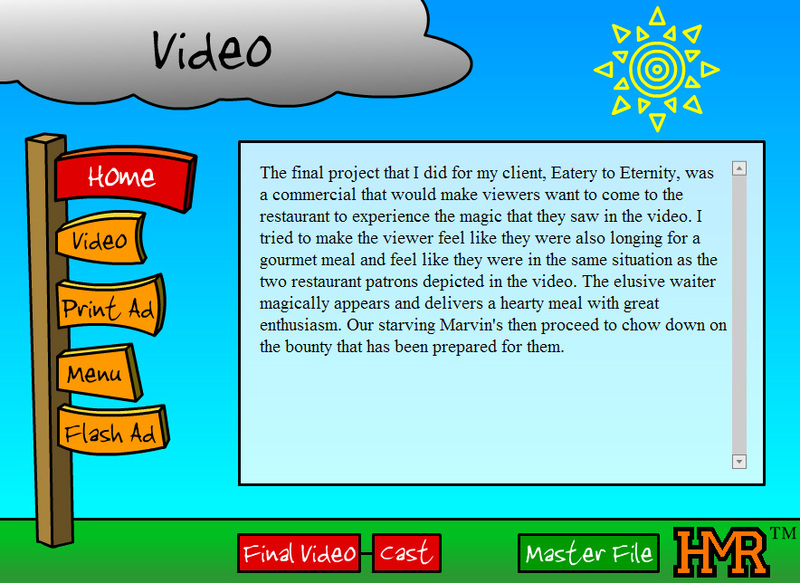 You may embed your video a FLV for "web" as well as include a high quality link of the final video. OPTIONAL - Web Design Page: This page should include your work from the Resume web site through to your Summative Portfolio. To begin your summative, you must setup an proper folder structure for your work on the D drive of the computer you've been working on for the majority of the course. You will need to work carefully to ensure all files are managed correctly in appropriate folders. See the sample directory structure below. Your exact structure may vary slightly, but it should resemble the sample. Take note of folder and page names. VERY IMPORTANT - You cannot use punctuation, spaces or specials characters in names (other than underscore or dash symbols). You will run into linking problems if you do not name files and folders VERY carefully. This folder will be used to "store/direct" the gif images when the web site is "exported" from Fireworks, i.e., you must ensure the Place Images in Images folder is "checked." Use this folder for all of your graphics (web headers), video FLV's, as well as your SWF files that have been "exported" from Flash. Use this folder for all of your MS Word files (unit reflections/write-ups) as well as the original Flash scroll text files. 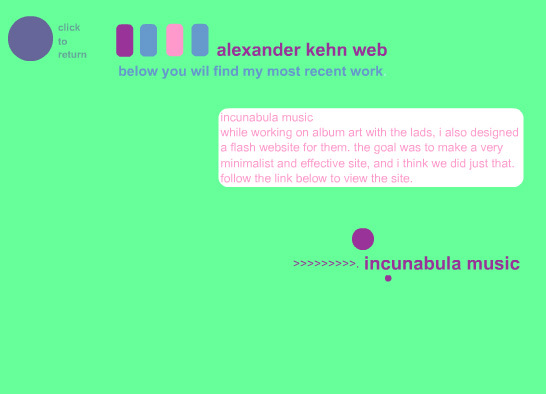 WANT HELP WITH COLOUR SCHEMES FOR YOUR SITE? Check out Adobe's KULER website, with plenty of amazing swatches to use. If you create an Adobe ID account, you can download or edit colour schemes for your own use. Min. 1-2 screenshots of work "in progress" for each project - ideally, these are created during project work, but can be reproduced during summative unit. Each screenshot will feature a short caption explaining what the shot depicts. 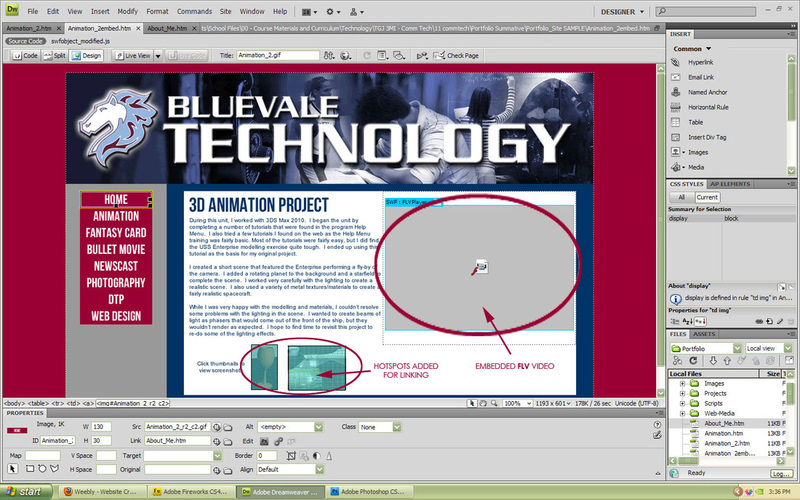 Click here for a simple tutorial on how to produce screen shots. 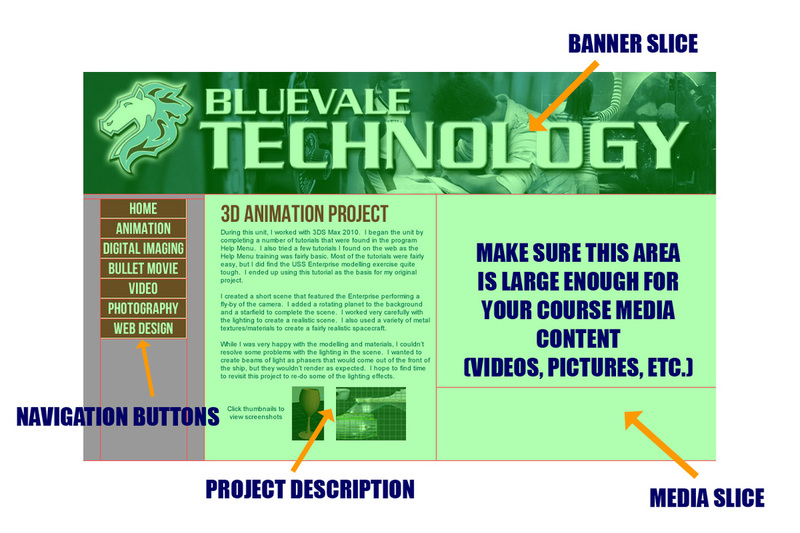 Links to final copies of project (video, audio, image files as required) - ALL CONTENT NEEDS TO BE "WEB FRIENDLY!" This means you will need to produce Jpeg copies of graphics (such as Coreldraw files) and FLV (Flash video) versions of your newscast, bullet movie and animation. These can be created using Adobe Media Encoder. You are STRONGLY recommended to create slices in Fireworks that are suitable sizes to accomodate media files when working with exported pages in Dreamweaver. See information on right. You will export each page from Fireworks as HTML and Images, making sure to save images into the subfolder you created in your portfolio folder in Part 1. Be VERY careful when completing this step for each page and ensure you are saving each file with a unique name to avoid graphics being copied over during export. 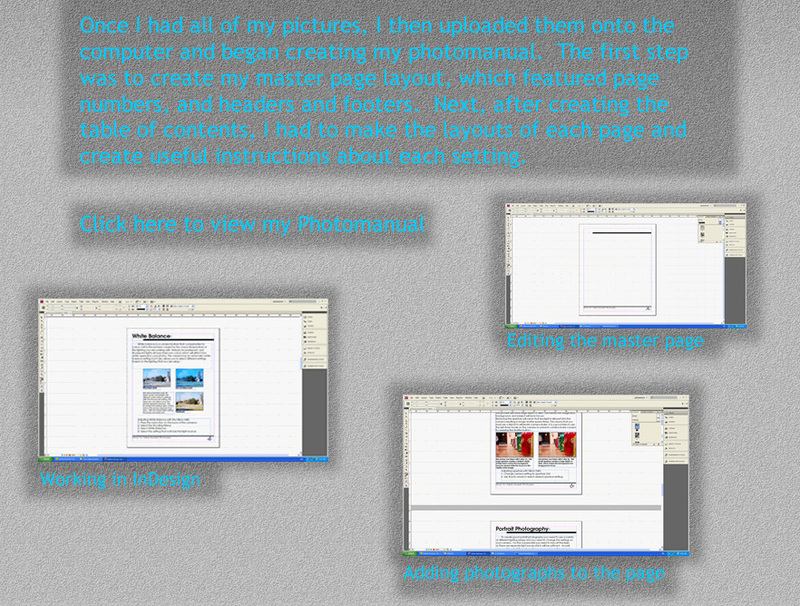 When working on your pages in Fireworks, you may want to create slices over page areas. 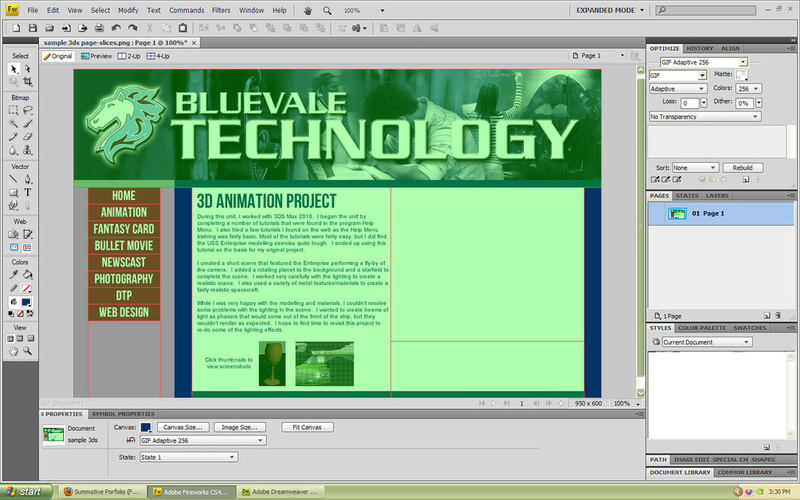 This allows you to create specific regions that can be removed or changed when working in Dreamweaver. This can be particularly helpful if you want to embed video files on a page or replace text/content. Click the image below to see what a sliced page in Fireworks can look like. Note the region beside the content text has a separate slice that will be used for placing an FLV video clip. 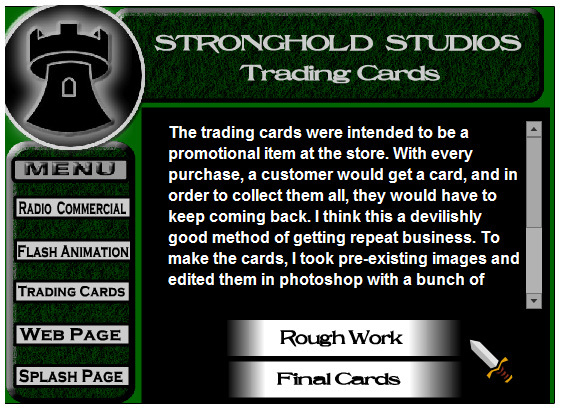 Click the links below to view some samples of portfolio pages from previous comm-tech classes. The samples range from low level 3 to level 4+. Take a careful look at design and content to determine which pages are likely to reach level 4. Once you have exported ALL Fireworks pages as HTML/IMAGES files, you will need to setup your site in Dreamweaver. Follow the steps outlined at the beginning of the course or refer to the Dreamweaver Help Menu for assistance in completing this step (or CLICK HERE to view the Adobe TV tutorial video on Defining Sites). 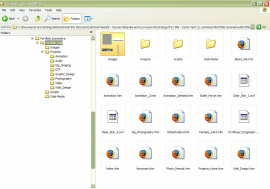 Make sure you select the portfolio folder you created in Part 1 as your root folder. Try to do as much of this as possible on your own. Part of the mark you receive for your summative is based on your ability to work independently to solve problems and demonstrate skills learned during the course. Using Dreamweaver linking tools, etc., you will set up all the required hyperlinks between pages (navigation buttons, etc.) 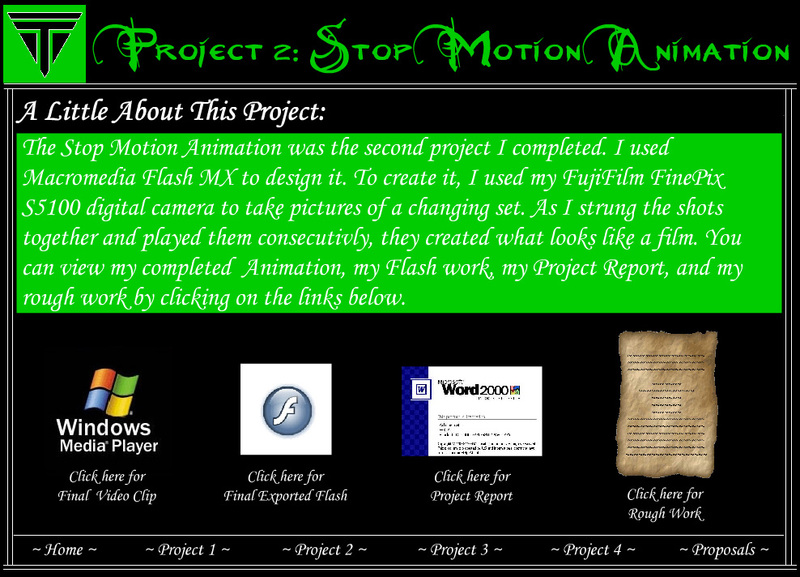 and links to project files. Make sure you save your pages after making links, etc. to ensure they will work. Preview your pages outside of Dreamweaver prior to handing in (open HTML files with Internet Explorer or Firefox if available) to ensure links work as expected and there are no broken images, etc. VERY IMPORTANT - do not move any files in your site folder after creating links and setting up navigation or you will break links and potentially make portions of your site unusable. Pretty simple...you will burn your summative website folder and all its contents to the portable hard-drive.